I will blogs Fridays either tonight or tomorrow morning...Their is a church picnic today(free food) and a movie has been shooting at the church I blog at, and will continue all month . It's hard to get in the church after the show because they lock up tight because of the movie stuff and random people have been wondering in the church. Okay in the 8Am line there was a nice looking brother...so I tried to size him up. What side of the fence is he on. Very handsome almost pretty. Nice hair, great teeth, nice size, nice height. I am in charge of the engineers over the LAX project (Yes This side)...yep I am helping to design it(hmmm?) I Live in Hollywood(?) He was a great guy for anyone who is into That kind of guy. Kate Blanchett ...She looked pregnant and it never came up. I asked two people if she looked like it to them...they said yes. She looked about four and a half months along...Congrats! 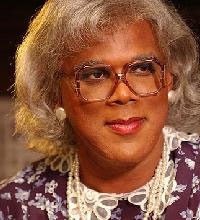 Tyler Perry...Okay this was interesting. 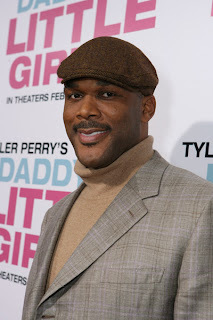 I think Tyler Perry is gay. I mean he made his living in drag! No problem. Jay kept asking about him going out and dating. Jay---Yes but you have to find time for the ladies. Tyler---Well I went out with Janet Jackson who is in the movie. Jay--- Great! Janet Jackson! Wow! then Tyler tries to change the subject. Tyler--- I bought a nice car( hoping to defer Jay) It's a Phantom. But one night I was driving and some guy just jumped in my car so I have this great car but I can't enjoy it. 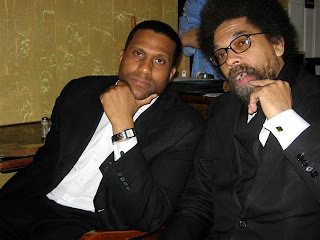 Tyler needs to come out just like Tavis Smiley so that this black male gay thing isn't such a thing anymore. White gay people are proud with their rainbow on their cars and things... The black community...No! So you have black women with down low brothers. The only person I ever see Tavis with is this old raggedy Dr. Guy who looks like jacked up Grady from Sanford and Son. If Tyler's mother cares so much...where is she...He was homeless like 10 years ago. His mother couldn't give him a place to stay but she can stop him from dating...doesn't add up. If black men that people looked up to would show that black gay men can be successful That would help the black community. Don't get me started on Magic Johnson...All I have to say is if he got HIV from some skanky woman...wouldn't there be some wild pack of HIV infected lesbians on the loose somewhere. Magic said he has never done done drugs...so he got HIV from drugs or a MAN. Annie Lennox was great! I love her back in the day and she still has a great voice! Did you hear that Marion Jones the five time Olympic winner might have to give up her five medal because she admitted to using drugs to win? DUH! who didn't know that.? If she was beating woman from Holland or England or something...no problem. 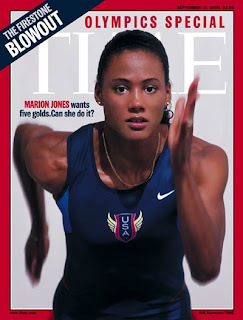 But Marion Jones was smoking women from AFRICA! Women from Africa outrun cheetahs and lions for fun!... and this chick from California beat them by miles! When I saw the race and Marion left Zulu and Simba I knew that she was using.Of course she was taking some go speed racer drugs. You did have to test her to know that. Let her keep them...she is not the only one. The Olympics should test better from now on if you get her you better test everyone. Flo Jo was using also...are they going to take hers away also...she paid for her medals with her life. She died because of all of that stuff they use to win. Who wants to watch regular people running. I can watch Cops for that. I want to watch superpeople. So does baseball and wrestler fans..etc. Test everyone!